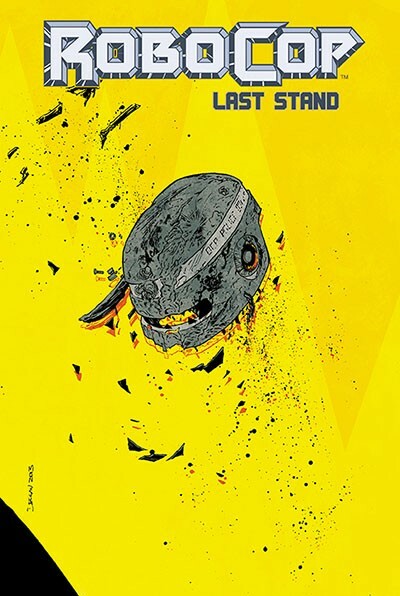 Ed Brisson (SHELTERED, SECRET AVENGERS) finishes the series with an original, self-contained story set in the world of classic RoboCop! 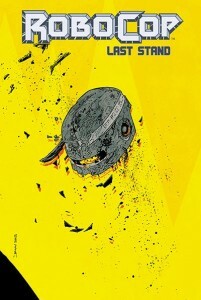 You’ve seen The Last Stand…but for RoboCop the war on crime is never over! The dust has barely settled from Robo’s… Um, sorry, he prefers “Alex”. Anyway, fresh off of his last knock down drag out battle, Officer Alex Murphy, aka: Robocop, hits the streets again. OCP has pulled out of Old Detroit, giving up on any hope of cleaning it up, and abandoning it to the chaos of the criminal element. A street gang calling themselves the Scavengers have dug up an old weapons cache, and they’re out to raise some hate and discontent. Our hero knows that he’s outnumbered. He knows that he’s outgunned. He knows that the police aren’t there anymore to back him up. Knowing all of that, he fires up the old squad car and heads out. There’s going to be trouble. Thankfully, Robo isn’t as alone as he thinks. Old Detroit still has some life in her, and her citizens aren’t totally ready to roll over. Frank Miller works his magic, as always, bringing old characters back to life instead of relying on the Hollywood standard of the “reboot”. This is the Robocop we know and love.